DISM is a Windows tool used by IT professionals to mount a Windows desktop image and to alter Windows features and settings. This stands for Deployment Imaging and Servicing Management (DISM). This tool is used to correct problems like system inconsistencies, unserviceable Windows image, issues caused by updates or changes, and errors like DISM Error 87, 112, 11, 50, 2, 3, 87,1726, 1393, 0x800f081f. Troubleshooters execute this tool on a command line by typing DISM.exe and a string of operators or switch. DISM Error 87 – The parameter is incorrect. DISM Error 112 – There is not enough space on the disk. DISM Error 11 – An attempt was made to load a program with an incorrect format. DISM Error 50 – The request is not supported. DISM Error 2 – The system cannot find the file specified. DISM Error 3 – The system cannot find the path specified. DISM Error 1726 – The remote procedure call failed. DISM Error 1393 – The disk structure is corrupted and unreadable. 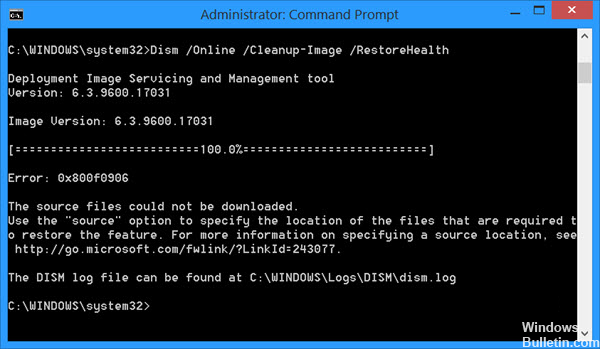 When you receive these error messages, you run the DISM tool using the Clean-up functionality. You will run a series of DISM commands to first revert all pending updates, then you will clean up the component store and finally, check the system before a final reboot. To show you really how this is done, read on. Reboot into Safe Mode and then Run sfc /scannow. After finishing the last command, let your computer boot up normally. This should fix the problem with your computer.